Australia's Ambassador to Greece, Mr John Griffin, visited the Greek Centre, on Thursday 7 April, and met with members of the Board of Management of the Greek Community of Melbourne (GCM). 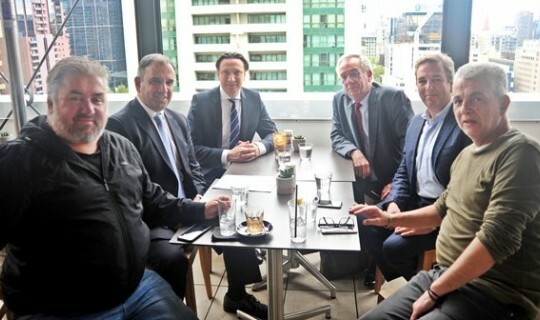 Μr Griffin met with the President of the GCM, Mr Bill Papastergiadis, the General Secretary Mr Costa Markos, the Treasurer Mr Marinis Pirpiris, Board member Mr Chris Sikavitsas and the director of the Greek Centre Mr Jorge Menidis. The Australian Ambassador was briefed on the programs and the activities of the Greek Community and discussed and exchanged ideas on various issues including the financial crisis in Greece, increased migration from Greece to Australia, education, tourism and trade. Mr. Griffin finally noted that through the close collaboration of the Embassy in Athens and the GCM - via relevant goverment departments and agencies - the two entities will seek a positive resolution to many issues of mutual concern.